Emtek is for sure one of the more popular brands on our site. It offers super excellent quality and you can be sure to see top of the line design hardware. Mick De Giulio, featured on House Beautiful magazine, must have recognized this, as his interior design of a kitchen was part of the 2012 Kitchen of the Year event! The kitchen featured Emtek Georgetown Crystal Cabinet Knobs on all of the cabinet drawers and cabinets in the amazing kitchen. I think it was Emtek’s honor to show off their delicate crystal Georgetown knobs that add a bit of class to the entire room. These knobs were a perfect touch to make a clean design for the kitchen of the year. The 1,000 square foot glamorous kitchen (that was showcased in New York’s Rockefeller Center) has everything you could ever dream up, such as sparkling tile, glass (Emtek Georgetown) cabinet knobs, a bold sink with a pop of color, top of the line appliances, open shelving, sleek dining area, spacious butlers pantry, even a gathering space near the kitchen with a cozy fireplace and furniture. If you like Emtek’s Georgian cabinet knob (like shown above), you can also find many more designs of cabinet hardware. I’m serious, there are over a 150 of cabinet knobs by Emtek, and that’s just cabinet knobs and just by Emtek! All unique! If you aren’t a cabinet knob fan, then be sure to check out all of Emtek’s cabinet pulls (220 + pulls), which also come in a huge variety of designs. Rustic, modern, antique, you name it! After you choose you are going with either the knobs or the pulls, then there is the material they are all made up of, such as solid brass (which is probably the most common – smooth material and pretty much offers any finish color), sandcast, wrought steel, crystal/glass, and porcelain! You can check out all of the kitchen or cabinet hardware here. I am sure the list is endless when it comes to shape, design, size for a cafe door and even where they may be used – like in a home or for a business. If you are looking for the hardware for your cafe doors, but aren’t sure your options let me suggest a few things. The most important are the hinges that are double acting. Like these hinges from Bommer. Depending on how heavy your cafe doors are will depend on what ones you get. The list of the smaller hinges range from 35 lbs to 103 lbs. Then there are the more heavy duty hinges that have a hold open capacity at 85 degrees, such as the Bommer Spring Pivot Heavy Duty Hinge that can hold up to 150 lbs or the Bommer Spring Pivot Medium Duty Hinge that can hold up to 90 lbs. Other hardware that would be good to look into are push plates. Push plates are mounted to the door and help protect your doors that you push to open. There are many stylish options out there to check out for sure. This one shown is from Emtek. It’s called the Emtek Modern Push Plate. This one is definitely one of the more simple plain styles, unlike some of the more fancy styles out there. You can check out more styles of push plates here. Fall is finally in the air! This is the best time of year, in my opinion anyway. I love that it’s not too hot and it’s not overly freezing as winter can sometimes get. The different color leaves on the trees… I just love everything about it. It’s a time to bring out the long sleeves because it’s a little too chilly to have bare arms, where in the summer it’s way too hot for that. It’s also more chill (as in laid back), because you have just started to mellow out from all the summer vacationing, where lets be honest it’s not always a relaxing vacation. On a completely different note, Emtek has some new cabinet hardware available, this will give you something to look at while you are chilling on your couch in your sweats with your laptop. This collection is more of a modern style. Who doesn’t like new and who wouldn’t like modern? Emtek’s Sweep knob is available in Oil Rubbed Bronze, Polished Nickel, Polished Chrome, and Satin Nickel. Emtek’s Sweep Pull is also available in Oil Rubbed Bronze, Polished Nickel, Polished Chrome, and Satin Nickel finishes and also available in 4 different sizes – 3.5″, 4″, 6″, and 8″ CC. The Bezier knobs and pulls are available in Oil Rubbed Bronze, Polished Nickel, Polished Chrome, and Satin Nickel finishes. The Bezier pull is available with 3.5″ CC, 4″ CC, and 6″ CC. And two different sizes are available for the Bezier cabinet knob – 1.25″ or 1.625″. This stylish T-Curve pull knob and bar pulls are available in polished nickel, oil rubbed bronze, satin nickel, and polished chrome. And there are are a variety of sizes for the bar pulls just like the ones above – 3.5″ CC, 4″ CC, 6″ CC. Do you have any idea how nice these keyless deadbolts are? I do, I have experienced such luxury at a Condo we stayed in when we traveled to the great state of Wyoming. Actually, now that I think of it, I don’t think it was the deadbolt, it was the deadbolt and lever combo, but it was Emtek I know that. And both work pretty much the same way. Anyway, we stayed in one Condo that had this keypad and one that had a regular key. Boring! Keypads are so much cooler, not to mention nicer. We didn’t have to worry about packing a key around, just had to memorize the code. So nice. And all you had to do was hit a button and it locked up. All Emtek levers/knobs turn with ease and they feel so heavy duty, because they are. I am sure if you order anything Emtek, you will be as pleased as I was. These come in a few different finishes and several levers. Make it fit your style. Can You Mix Brands of Hardware? We recommend sticking with the same brand when ordering hardware for a few reasons. Like, being able to have them keyed alike (don’t get me wrong, it is possible to have some of the brands keyed alike, so give us a call if this is the case and we can find out for you.) and it also gives certainty of matching the finish, but what happens if you have to mix the brands, because what you need is made by someone else? Well let’s see what we can do. Can you tell there are 2 different brands in the picture below? The privacy bolt is from Linnea and the Lever is from Emtek. Try and stick with finishes that are easy to match, like satin nickels, satin chromes, polished chromes and even flat or matte blacks. The really hard ones to match are bronze finishes. If this still hasn’t answered your question, please contact us, we will do everything we can to make it work. Flush Pulls? You need em? We got em! Door hardware for 3" thick door. Custom doors come in all sizes. 3″ thick is a big door, and most door hardware manufacturers will not have anything available to fit something that thick. Often times we have customers that have doors just a bit larger than standard thickness [1 3/8″ – 1 3/4″]. Most of the time customers that have thicker doors are in the 2 1/4″ – 2 1/2″ thickness range. Luckily Emtek brand hardware has a fit kit available for most of their products to accomodate these thicker doors. Sometimes we have customers with a door even thicker. Just now I had a call from a customer who had been searching for weeks trying to find a deadbolt for his 3″ thick door. While most all Emtek brand hardware will accomodate doors that are thicker than standard, only a few will accomodate doors 3″ thick. 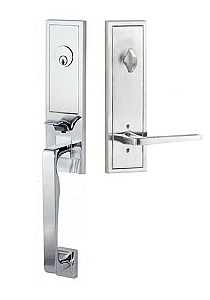 Check out the Emtek Brass Series Deadbolts, Door knobs and lever handles for options. Once you choose as style you like, you can choose door thickness options from the pull down menu before adding the items to your cart. Have a 3″ thick door yourself? give us a call and we can show you what is available. Have a door that is thicker than 3 Inches? Well, your options are pretty limited. You may even have to have something custom made.